Co-founder of the Independent Journalists’ Network as a vehicle to circumvent the pervasive influence of political and business figures on Armenia’s media. Melikbekyan is working on a documentary about the stigma and discrimination suffered by the rising number of HIV-positive people in his socially conservative country. By the time our team finished interviewing people with HIV in October, we knew we had found another critical dimension of the story. We had been focusing on the considerable discrimination that people with HIV/AIDS suffer in Armenia, but one of our interviewees told us of problems with medical treatment. In Armenia, people diagnosed with HIV do not get the immediate treatment that the World Health Organization says is necessary to improve outcomes for those infected and to stem transmission of the virus. On a visit to the National Center for AIDS Prevention, we spoke with doctors who admitted that they do not start treatment until a patient’s CD4 cells, or T-cells – the infection-fighters whose numbers dwindle in infected people – fall to a certain level. Doctors also told us that they were working to implement new WHO recommendations, which include immediate treatment, and which we later learned have been on the table since 2015. As a result, we have decided to broaden our scope to include issues of treatment. We are now trying to determine if doctors in Armenia are being provided with enough anti-retroviral drugs in order to begin treatment upon diagnosis. Imagine life for someone with HIV 25 years ago and you might have an idea of what it’s like for the nearly 4,000 people with HIV or AIDS in Armenia today. In a society where many still believe the virus can be casually transmitted, HIV+ people often keep their diagnosis a secret. Worse, health care professionals sometimes neglect to follow the latest treatment protocols or even refuse to treat an infected person for fear of contagion. With help from Press Start donors, Armen Melikbekyan and a team from epress.am magazine talked to HIV+ people and those who work with them to sketch a video portrait of HIV in Armenia today. 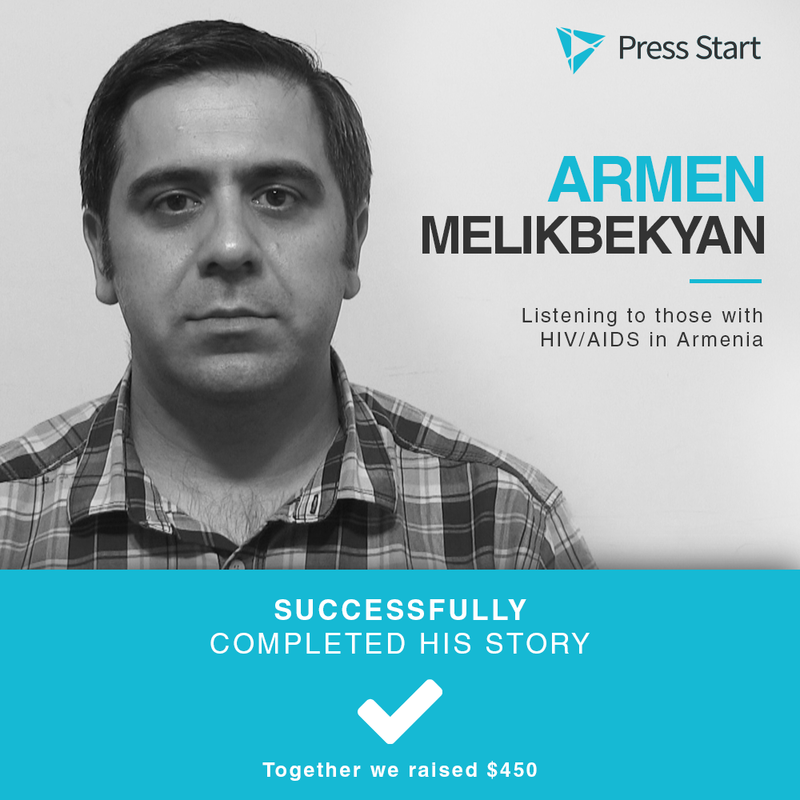 In the coming months, Press Start will be checking to see if Armen’s work has local impact and, if so, reporting back to his donors. Armen Melikbekyan's professional life has been punctuated by two wrenching events. The first came in March 2008, when the violent breakup of a protesters' camp after a presidential election resulted in the deaths of 10 people, for which no one has yet been held to account. The tragedy confirmed him in his earlier decision to broaden his focus from sports journalism to politics and human rights. The second came two years later, when he and other journalists at a leading Armenian news organization were ordered to help protect the business interests of a group of political elites. Instead, they walked away, forming the Independent Journalists' Network in an effort to break free of the corporate and political powers that control most of Armenia's media. "Media in Armenia are controlled and manipulated by the authorities and/or different political groups, who aim to curtail the effectiveness of independent representatives of civil society and the press," Melikbekyan says. "Journalists have to work under constant pressure as well from their 'colleagues.' The significant and essential results of their work are buried under a steady stream of biased information produced by a lot of media outlets controlled by the authorities." The IJN set up Epress.am, a website managed exclusively by local journalists, and has produced reporting that got the public's attention. For example, the group's journalists covered the case of a 21-year-old Armenian man who was, they believed, wrongfully arrested and charged in 2013 with the murder of a 15-year-old boy. After a three-year pretrial and trial period, during which the defendant was held in jail, he was acquitted, despite the prosecution's demand for a nine-and-half-year-prison term. IJN produced more than 40 reports in cooperation with human rights organizations and lawyers during the trial, some of which documented violations of court procedures. They believe their reporting affected the outcome of the case. "For me, being a journalist means having the chance to cover human rights, freedom of speech, and social issues in Armenia and in the region. I think it's important to break the silence of the mass media while covering under- or unreported events so that they become the subjects of a broader public discussion." Melikbekyan and his colleagues are now working on a film about the plight of people with HIV/AIDS, a huge majority of whom report facing discrimination and abuse in conservative Armenian society. Click here to see Armen Melikbekyan's reporting proposal.